Product prices and availability are accurate as of 2019-04-20 07:20:11 EDT and are subject to change. Any price and availability information displayed on http://www.amazon.com/ at the time of purchase will apply to the purchase of this product. Please check the ISBN that your instructor provided. If the ISBN-13 does not match this product (9781305389021) or its Printed Access Card equivalent (9781305389038) this may not be the correct product. In some cases, you may also require a course code from your Instructor. 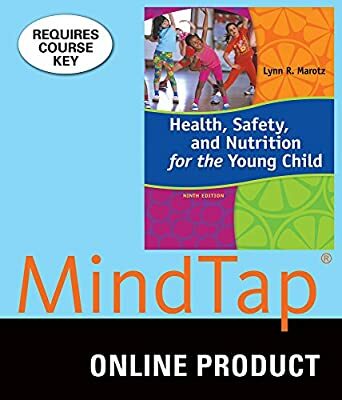 MINDTAP EDUCATION FOR MAROTZ'S HEALTH, SAFETY, AND NUTRITION FOR THE YOUNG CHILD, 9th Edition engages you to produce your best work – consistently. By seamlessly integrating course material with videos, activities, apps, and much more, MindTap creates a unique learning path that fosters increased comprehension and efficiency. A highly personalized, fully customizable learning platform, MindTap helps students to elevate thinking by guiding them to: know, remember, and understand concepts critical to becoming a great teacher; apply concepts, create tools, and demonstrate performance and competency in key areas in the course; prepare artifacts for the portfolio and eventual state licensure to launch a successful teaching career; and develop the habits to become a reflective practitioner. As students move through each chapter's Learning Path, they engage in a scaffolded learning experience designed to move them up Bloom's Revised Taxonomy from lower- to higher-order thinking skills. This product requires a Course Key from your Instructor to fully activate. Please consult your Professor or class syllabus for the specific Course Key. ISBN: 9781305389021 Access to this product is valid for 180 days of usage. After this period, this product can be viewed under the "view expired" link in your CengageBrain account.